Record numbers of students have enrolled at La Sierra University this fall quarter. According to figures released by the university, 2,098 students registered at the start of the current school year, an increase of 12.9 percent over last years total of 1,857. Itâ€™s the first time La Sierra has topped the 2,000 mark in enrollment since its establishment as a university in 1990, and exceeds the previous enrollment record of 1,946 set in the fall of 2003. 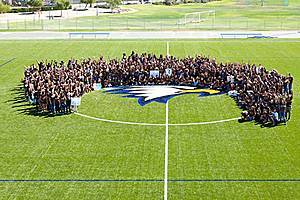 La Sierra also enrolled its largest freshman class since 1990. This year 440 freshman chose La Sierra to continue their education, topping last yearâ€™s freshman class of 348 by 26.4 percent. Record enrollment numbers also have had a positive impact on the campus financial outlook. Preliminary figures show that the financial full-time equivalent enrollment is 162 over the budgeted expectation. And residence halls are showing a significant increase in usage, exceeding budget projections as well. October 11, 2010 in News. Higher enrollment is always wonderful news for a university. With the surge of students coming into La Sierra, it becomes all the more important that the administration address the problem areas in their biology department in a timely manner. It’s been over a year and they still have not demonstrated any change in the curriculum of the biology courses in question. Let’s hope they can do this on their own without the intervention of the Union. I’m hopeful that LSU is still capable of addressing its own issues in house. It would be interesting to know what type of students are being attracted to LSU, specifically in regard to their world view on origins. …maybe students that like to get a college education that teaches critical thinking, not blind doctrine. Why is higher enrollment “always wonderful news for a university”? Often short-term, and short-sighted “success” is the prelude to long-term failure and collapse. This is seen in every type of endeavor, but may be easiest to understand in the financial world. Enrollment, like income, is only one measure of an institution. And academic enrollment, like all measures of convenience and popularity, fails miserably as a reliable predictor of outcomes. The drunk who is loudly rejoicing at the party, may be throwing up at tomorrow’s hangover. Our greatest danger is apparent success. When David was winning wars and at the peak of his popularity, he suffered his greatest shame with the fatal beauty of Bathsheba. Universities with increasing enrollment (including Southern, by the way) would do well to ponder Christ’s warning, “Woe unto you, when all men shall speak well of you! for so did their fathers to the false prophets” Luke 6:26. As Christians, we do not take a short-sighted view of success. Success is measured by faithfulness to God. How often today’s heroes are tomorrows villains. For a time David failed to take a longer term view, “For I was envious of the boastful, when I saw the prosperity of the wicked” Ps 73:3 NKJ. Daniel was shown a power that would be mighty, and “destroy wonderfully, and shall prosper” but would “destroy the mighty and the holy people” Dan 8:24. “If you lower the standard in order to secure popularity and an increase of numbers, and then make this increase a cause of rejoicing, you show great blindness. If numbers were evidence of success, Satan might claim the pre-eminence; for in this world his followers are largely in the majority. It is the degree of moral power pervading the college that is a test of its prosperity. It is the virtue, intelligence, and piety of the people composing our churches, not their numbers, that should be a source of joy and thankfulness” 5T 31.3. @JImmy: I certainly hope you are not exuding the same narrow-mindedness that many evolutionary biologists have–that the science is settled, and thus they ignore all the evidence to their settled “science.” When a scientist no longer becomes interested in looking at all the data and its implications, I think the student under his/her tutelage is endanger of receiving only a partial and un-critical educational. You appear to making an assumption that many others have made that is the church is against having evolution taught–how wrong you are. By all means teach evolutionary theory, but it is by no means a sacred cow that should be guarded to the exclusion of all the evidence that opposes it. Is this the type of critical-thinking you are supporting? Because this is the type of education LSU is giving–narrow. Shane…please. Your point is pretty ironic. You make my point for me. The position espoused on these pages supposes that the origins question is settled so thanks for pointing out that we need open mindedness – my point exactly. As is evidence in the data, people will seek out truth as they are at LSU in record numbers (regardless of the dismissal by Mills above). The empty threats from conferences, GC, and the bizarre folks here won’t have an impact on that fact. From what I see around the web, this conspiracy theory of yours is based on incomplete facts, poor sources, and downright lies. I’m pretty close to this and am shocked that the naivety of these that think there is some movement or conspiracy that is anti-Adventist. The distorted lens through which this site looks is pretty corrupt and is doing far more harm than any defective university professor has done or will do. A pretty sad legacy in my opinion, but knock yourself out. Turns out that the doctrine on origins that we find in the Bible is pretty obvious. The only “question” on origins is how long will LSU have to evangelize for the atheist-centric view of origins promoted in evolutionism. Darwin was finally forced to admit that the two doctrines on origins cannot be married to each other the way some theistic evolutionists would like to imagine. so thanks for pointing out that we need open mindedness – my point exactly. As is evidence in the data, people will seek out truth as they are at LSU in record numbers (regardless of the dismissal by Mills above). It is not clear at all that the 440 freshmen at LSU are all biology majors clammoring for all the evolutionism that LSU will choose to force down their throats. Or that they are all religion majors lining up for that last drop of evolutionist dogma coming from LSU’s religion department. Who knows maybe there are a few dozen more “Loui Bishops” in that crowd looking to make a name for themselves. In fact with all the current focus on evolution at LSU — it is not even certain that the LSU all-evolutionism-all-the-time agenda will be as forthcoming as it has been in years past. The empty threats from conferences, GC, and the bizarre folks here won’t have an impact on that fact. Well part of your statement is correct. If all LSU has to contend with is “empty threats from conference execs” then they will not change from last year’s apostasy-at-all-costs program in the religion and biology departments. From what I see around the web, this conspiracy theory of yours is based on incomplete facts, poor sources, and downright lies. That is a pretty good “no-sources” and “no-facts” example of an empty accusation. You should at the very least try to step up to the plate and MATCH the sources already posted at this site since you claim to have even better ones for making your case. I’m pretty close to this and am shocked that the naivety of these that think there is some movement or conspiracy that is anti-Adventist. What do you mean by “anti-Adventist”??? Teaching a doctrine on origins that contradicts the 28 Fundamental Beliefs statement #6 and fits what 3SG 90-91 calls “the worst form of infidelity”? Will you have “more clarity” on what is “anti-Adventist” once the FB#6 is made “lock step” with the “affirmation of creation” statement? On what basis do you think this site is doing any harm at all? What is your source? Your data? Your evidence for that wild claim. Thin air? Inquiring minds want to know. @JImmy: Yes, the Seventh-day Adventist Church believes the Bible is a divine revelation of God’s will and the creation account is trustworthy; it also believes there is good evidence that confirms the historicity of the Bible. I’m not advocating that bias is a bad thing. I believe everyone is biased; however, the difference between the position I’m advocating and LSU’s is this: LSU is only presenting one side, while I’m advocating, at the very least as a Seventh-day Adventist institution, they present both sides. I would prefer that they come down on the side of the biblical creation model. Like you, I’m pretty close to the situation. There is no conspiracy theory being advocated by Educate Truth. I would like to challenge you to point out one incomplete fact, poor source, or downright lie that has been published by Educate Truth. Practically everything we publish comes from primary sources, so good luck. I’m human though so I might have missed something and am always happy to correct it. Call what you like, but without any evidence all you have are assertions. There was record breaking enrollment at Southern Adventist University this fall. so thanks for pointing out that we need open mindedness â€“ my point exactly. As is evidence in the data, people will seek out truth as they are at LSU in record numbers (regardless of the dismissal by Mills above). The empty threats from conferences, GC, and the bizarre folks here wonâ€™t have an impact on that fact. Iâ€™m pretty close to this and am shocked that the naivety of these that think there is some movement or conspiracy that is anti-Adventist. @JImmy: Jimmy, it really isn’t worth it to argue with them here, I’ve tried previously. The fact is that us students do not want to go to a school that simply promotes church doctrine, we want a school that supports church doctrine while having a wide variety of view points within it’s faculty. Evidently that’s a novel concept. @Adventist in High School: Yes, it’s a novel concept for LSU because they don’t even promote church doctrine, at least not in regard to origins. Educate Truth has been pushing for, at the very least, to have a variety of views presented in the biology department. Of course it would be preferable that LSU fall on the side of creation, but since they don’t it would be good of them to at least present evidence from both sides. I challenge anyone to show me a biology class at LSU that presents the evidence from the opposing side. If LSU could do that, it would be one giant leap in the right direction. Yes, itâ€™s a novel concept for LSU because they donâ€™t even promote church doctrine, at least not in regard to origins. Which is why La Sierra has seen it’s enrollment go up. I saw that play out with the senior class last year and it’s playing out again this year. My school had never seen that many students go to La Sierra as they have this year. Educate Truth has been pushing for, at the very least, to have a variety of views presented in the biology department. Of course it would be preferable that LSU fall on the side of creation, but since they donâ€™t it would be good of them to at least present evidence from both sides. La Sierra has already stated that it’s position falls on the side of creation. However, as even one of your scientists at the Geological Research Institute admitted, you can’t argue that from a scientific perspective, only from a theological perspective. It’s hard to present scientific evidence that does not exist. …and I challenge anyone to show me from a credible peer reviewed scientific journal evidence for young earth creationism. I’m hoping I won’t get mobbed like I did the last time I did here..
@Adventist in High School: You said, “students do not want to go to a school that simply promotes church doctrine.” I agree, and God has not asked us to believe anything without first giving us the evidence upon which to base our faith. However, you jump to an unsupported conclusion as to the reason for LSU’s jump in enrollment. I could just as easily assert that the jump is a result of LSU attracting more like minded students in regard to origins. That would be a totally unfounded assertion because I have absolutely nothing to back it up with. We can speculate all we want, but until we poll all the new freshman we won’t know. So making up reasons to fit your argument in relation to enrollment do you little good. La Sierra has payed lip service to the FB #6, but in practice they side with evolutionary biology. This can be seen in a number of their classes. Your appeal to a dissenting scientist as an authority of what is actual evidence is weak at best. It’s a straw-man and equivalent to appealing to the quality of a whole herd because of one of them is lame. Now before you get ad hominem on these journals, consider arguing against the evidence they contain first. So tell me what is so un-credible about Origins for example? Ok, now I’m waiting for you to produce one biology class where the evidence for the opposing side is presented. Alright, fair enough. My reason for making that conclusion is the fact that I know a fair number, say 20 or so, of the the students that are a part of that “record freshman class” and I know that La Sierra’s status as a progressive Adventist University evidenced by the fact that they teach about evolution played a large part of their thinking. So yes, my sample is about 5% of the class. Perhaps I should have defined that better. When I say credible, I mean it is accepted and used by the scientific community at large. Unlike the answers research journal which had authors go under a pseudonym. My challenge still stands, I would like to see one evidence from a credible/mainstream scientific journal for young earth creationism. October 13, 2010 @JImmy: Jimmy, it really isn’t worth it to argue with them here, I’ve tried previously. The fact is that us students do not want to go to a school that simply promotes church doctrine, we want a school that supports church doctrine while having a wide variety of view points within it’s faculty. Evidently that’s a novel concept. IF we were in the business of hiring teachers that had a “wide variety of view points” on the doctrine on origins, the inspiration of the Bible, the mission of the church, Calvinism, praying to the dead, infant baptism, the Sabbath, the Heavenly Sanctuary… etc, we would be creating a bedlam of chaos and confusion in our church that would almost equal that which you can find in public education today. I have attended both SDA and public universities – I know whereof I speak. The whole point of an SDA university is to promote truth rather than merely promoting the confused bedlam of voices so common and intrinsic to the public university, for “diversity’s sake”. The reason for diverting tithe and offering dollars to support and build SDA universities is to promote the mission and message of the SDA denomination. It is NOT to “create better evolutionary biologists than UC Berkley”. If some of our students choose to study evolutionary biology to demonstrate the fixed limits of variation within a static genome – that is wonderful. But that is not the stated mission, message or intent of biologists like Bradley. The purpose of this web site was to make SDA parents aware of the problem. Granted – the 440 freshmen signed up for LSU are NOT likely to all be biology majors anxious to get one last sacrifice-all-for-evolutionism lecture from Bradely or Fritz Guy. And one has to suppose that one or two of them may actually be looking to improve on Loui Bishop’s record. (Who knows what that kind of publicity is drawing). One thing is for certain, the next student to be slammed by the LSU professors for daring to suppose the Bible might have the right answer on the subject of origins is “now aware” of a great many more options than Bishop may ever have imagined. October 13, 2010 @JImmy: Jimmy, it really isnâ€™t worth it to argue with them here, Iâ€™ve tried previously. The fact is that us students do not want to go to a school that simply promotes church doctrine, we want a school that supports church doctrine while having a wide variety of view points within itâ€™s faculty. Evidently thatâ€™s a novel concept. It is not possible to be supportive of the Seventh-day Adventist Church while undermining, and/or blatantly teaching against the church’s fundamental beliefs. I am confident that if LSU under a pseudonym submitted to the General Conference its actual syllabi and course contents in the areas of religion and biology and petitioned for the right to use the SDA name, they would be denied. This is not a question of what science assumes to know at present or what any individual or small group chooses to believe, or what is politically correct or expedient, this is fidelity to a stated code of beliefs, to an employing organization and to a world church. Why do those who think they should be allowed to teach what THEY want, also think they should be able to use the tithe, offerings, donations, tuition, organizational name and logo of people who are opposed to what they’re teaching? I therefore have to heartily commend web-sites like this, and for those bringing these issues to light – somehow, I wish that there was more that we could be doing! Praise God for the leadership we have in the GC, we should all be praying that God will be able to work mightily through them to meet Satan’s forces on issues such as this as well as the many others that we know he is hurling at our church in these last days. It is not possible to be supportive of the Seventh-day Adventist Church while undermining, and/or blatantly teaching against the churchâ€™s fundamental beliefs. I am confident that if LSU under a pseudonym submitted to the General Conference its actual syllabi and course contents in the areas of religion and biology and petitioned for the right to use the SDA name, they would be denied. That is an interesting and perceptive point with a lot of implications. Thank you. I was thinking about how Satan sets things up to make it appear that truth is a failure. Just suppose that many parents and students are choosing La Sierra for its stand on evolution. 1. Over time why would these continue to support a school that is expensive and increasingly less distinct and unique. Why pay a high tuition for what could be much more inexpensively obtained in a state university. After a short high mark in attendance, there would be the inevitable plateau, then the slow fade into insignificance as the university continues either morphing into a struggling community college or a struggling “church” related university. 2. Suppose that Christ cleansed the school as Christ cleanse the temple. These same students may withdraw and the enrollment would decrease. Testing truths decrease evangelistic attendance. Testing truths decrease school attendance. Heaven would declare this decrease a successful pruning. Satan’s followers would declare the reforms a failure and trumpet the decreased enrollment as proof their approach is superior. yes and Amen to Susie. She hit the nail on the head. That is the bottom line of this issue. No one in this debate would expect to be long employed if they chose to adopt principles and practices that were questionable or oppositional to their employer’s values and core beliefs. There would be no question if they were put on advice, counseling, warning and then termination. It is the way it works. And the entire world seems to understand this. It seems to become strangely blurred when it comes to employment in this religious institution. Suddenly “there is room enough for everyone to have their own position and beliefs and even more amazing that this argument is presented in favor of those receiving the paycheck. Absolutely amazing, I say. No one is forcing anyone to remain employed, yet year after year a paycheck is drawn. No outside organization tolerates the “there is room enough here for all of us” position, and then continues to pay the person who has such an attitude. It is just absolutely incredible. LSU does not “teach in a vacuum”. I have no doubt that they have support for what they are doing from some people at LLU and from many people in the SECC itself. Most of their mainline SECC supporters will likely never even see these pages. Their current political challenge is primarily in the form of an SDA GC Administration willing to take “the necessary steps” to bring this problem to a close. The environment of the SECC provides LSU a lot of wiggle room slowly dragging their feet to provide some kind of token solution if that is the road they wish to take. Our current organizational structure relies on spiritual maturity and insight of the constituents of the conferences and unions to make the necessary changes. The fact that the GC Admin is having to step in – in some way, reflects a degree of failure in that model when it comes to the SECC and the Pacific Union. The problem is compounded at several levels all working together (possibly unwittingly) to create the end result. God is always the majority. LOL! I always love it the the accusers demand more evidence than the accusation! I see all kinds of supposition about this or that hiring, firing, faculty change. Most are wrong and not factual, merely idle speculation. The so-called sources I’ve seen quoted are wrong in most cases. My proof? I have a front seat view of this and find this all laughable. To be honest, enrollment is up in most places so this isn’t likely a sign of anything. But the fact that people are going to this school from “good” Adventist homes and the communicate demonstrates that the school is doing an effective job providing a college education. I love the way Phil Mills is reading the numbers how he sees them. No attempt to to understand or find some logical explanation he simply says this proves that Satan is tricking us. Wow! That is great! I also love his thought that schools might actually ask for approval for course content. BTW, this is higher education where that is that notion is lunacy and downright immoral and unethical. Legitimate higher education will never be subject to that and the point just proves the insanity of the argument. Again, good luck with this. Good luck to your children who will be the unfortunately benefactors of a college education that fails to do it’s primary job – teach critical thinking. God is always the minority. This is not correct. God is always in control…always able to over-rule in the affairs of men. Therefore it makes no difference whether folks see Him as a minority; His will – WILL ultimately be done on Earth as it is in Heaven! Yes, it’s a novel concept for LSU because they don’t even promote church doctrine, at least not in regard to origins. Educate Truth has been pushing for, at the very least, to have a variety of views presented in the biology department. Of course it would be preferable that LSU fall on the side of creation, but since they don’t it would be good of them to at least present evidence from both sides. It is not possible to be supportive of the Seventh-day Adventist Church while undermining, and/or blatantly teaching against the church’s fundamental beliefs. I am confident that if LSU under a pseudonym submitted to the General Conference its actual syllabi and course contents in the areas of religion and biology and petitioned for the right to use the SDA name, they would be denied.